Olive Garden Never Ending Pasta Bowl: Is It a Good Deal? Olive Garden’s Never Ending Pasta Bowl is Back. Is It a Good Deal? Olive Garden’s Never Ending Pasta Bowl promotion returns on Oct. 3. All the $100 pasta passes for near-unlimited access to pasta are long gone, but through Nov. 20, you can get a bottomless pit of pasta for $9.99. If you’re a woman of simple pleasures, like me, a pasta-and-sauce combo might be enough to satiate your carb craving for at least an evening. But if you want to add protein — Olive Garden lets you choose from grilled chicken, italian sausage, meatballs, crispy chicken fritta or crispy shrimp fritta — you’ll have to pay an extra fee starting at $2.99. That brings the price of this refillable pasta smorgasbord up to at least $12.98 before tax. That’s almost the cost of an entree: on the regular menu, Fettuccine Alfredo costs $12.99, Chicken Alfredo is $14.99, and Shrimp Alfredo costs $16.79. Sure, the Never Ending Pasta Bowl never ends, but you can’t take refill portions with you. How much pasta can you really eat? Luckily, there’s a smarter option. Instead of the Never Ending Pasta Bowl, choose the Cucina Mia menu of classic pasta combinations, which also start at $9.99. You’ll still have to pay for protein, from $2.49 to add two sausage links to $4.99 to add 20 sauteed shrimp to your dish. But there are a few perks to this menu option that still make it a better deal than the Never Ending Pasta Bowl. Cucina Mia offers a couple of additional options that aren’t available for the Never Ending Pasta Bowl, such as garlic white wine sauce and sauteed shrimp. You can also take this dish home. While official Olive Garden rules say all Never Ending Pasta Bowls are for dine-in only, you can order Cucina Mia dishes to go, or you can ask for a doggie bag if you’re eating there. 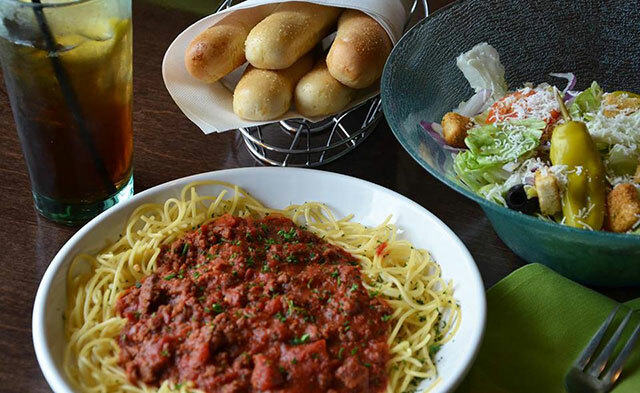 There are no refills on the Cucina Mia, but you might not need them: Olive Garden’s nutritional facts don’t hide that its meals are packed with calories. The five-cheese marinara sauce on the Cucina Mia menu has 460 calories per serving, 34 grams of fat and 1140 mg of sodium, for instance. Asiago garlic alfredo sauce? 940 calories, 91 grams of fat, 1320 mg of sodium. And that’s just the sauce — those numbers don’t cover the pasta or the meat toppings. So yes, you could get the Never Ending Pasta Bowl. Or you could get basically the same dish, with the chance to take half home with you and eat it for lunch the next day. Now that’s a Penny Hoarder move. Your Turn: Will you line up for the Never Ending Pasta Bowl at Olive Garden? Update: We’ve corrected the information regarding the upcharge for adding protein to Cucina Mia dishes. Lisa Rowan is a writer and producer at The Penny Hoarder. Pasta is her favorite.